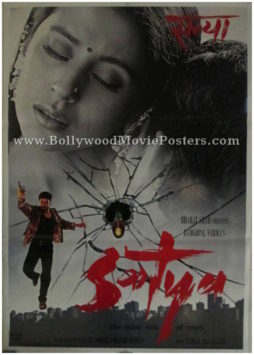 Classic Bollywood poster for sale of the old Hindi film, Bandit Queen (1994). This is an actual surviving classic Bollywood poster for sale of the 1994 cult Hindi drama that was directed by Shekhar Kapur and starred Seema Biswas in the title role of Bandit Queen. The film was a biographical based on the life of Phoolan Devi – a notorious female bandit who later became a Member of Parliament. Bandit Queen won the National Film Award for Best Feature Film in Hindi and the Filmfare Critics Award for Best Movie and Best Direction. The film was premiered in the Director’s Fortnight section of the 1994 Cannes Film Festival, and was screened at the Edinburgh Film Festival. 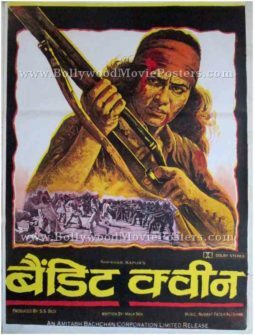 Bandit Queen was also selected as the Indian entry for the Best Foreign Language Film at the 67th Academy Awards, making this classic Bollywood poster, highly collectible! This classic Bollywood poster was designed and printed for publicity of the film during the initial release run of the film (somewhere in the mid 1990s) but never ended up being used. This Bandit Queen movie poster was originally designed in hand painted oil on canvas format by an art studio. 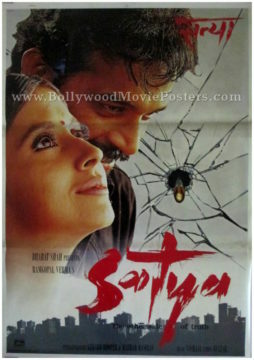 Lead actress Seema Biswas is seen holding a rifle in a stunning hand painted avatar prominently in the poster. A key mass murder scene from the film is seen at the bottom of this Bandit Queen poster. This Bandit Queen poster features stunning typography in yellow at the bottom set against a black background that gives it an eye catching appearance.